Bar and Restaurant Design – branding, styles & spaces. What things do we think about when we begin to design a bar or restaurant? Whether an established venue or a brand new opening, there are various key components necessary to creating an unforgettable end product. Branding, naturally, is one of them and, if positioned accurately, it will allow you to achieve a truly unique personality for any venue. Branding is important in order to make sure that there is a strong narrative carried through the whole design, ensuring each detail plays its part in a natural way. Branding is not an exact synonym for design though; it forms part of a whole idea, a concept and a story. Branding it important when thinking of the longevity of the finished works. Longevity is a particularly important element in the restaurant industry and so design and branding should be looked at from long-term position. Similarly, with a bar, if there are to be a subsequent outlets in a chain, it is crucial to ensure the brand retains consistency in order to be remembered and recognised. If the foundation is established correctly from the outset it will be easy to successfully continue it through a lifetime of promotional campaigns. In terms of style it goes without saying that venues need to be interesting and inviting, not cliche or boring. There are many ideas out there at the moment, from industrial, with its cold stark metal look and exposed brickwork, to pastiche and arty. A super comfortable new restaurant with a country kitchen feel, a bar composed of separate rooms with different functions or bar that is decorated to feel home from home with soft sofas and rich colours, the chosen style has to be aspirational to the audience. People want to frequent quirky places and talk about them afterwards. People love new but they also look for comfort and the feeling of being at ease. Identifying target audience is central to thinking about style, therefore. Designing is not always about making perfectly organised spaces. Sometimes it can be wonderful to see a space that gradually unfolds and uncover secrets as you wander around and ponder the space. The flow of space must be really well-thought-out so that am almost instant feeling is created on entry and there is not possibility for any sense of negativity is experienced. How do spaces make customers feel – how should a guest to feel when they arrive, for example. 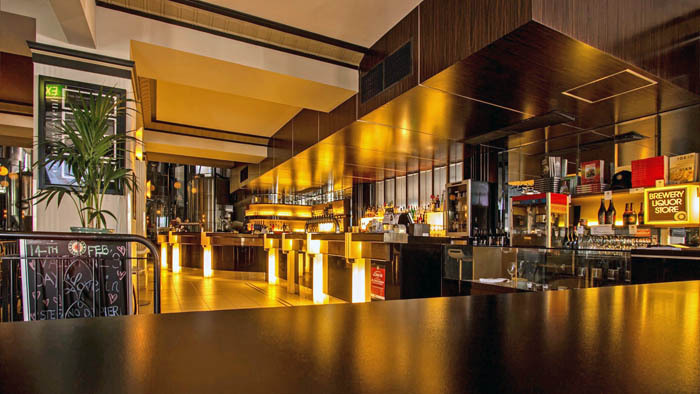 Materials used cleverly and in a sensual way, such as a stunning wooden bar, a textured, coloured piece of glass, a combination of style that is both new and old, can have the instant desired effect that will leave a lasting impression on customers within well-designed spaces.